e-Whiskers are hair-like structures that are paving the way for robotic and prosthetics human like skin. The University of Texas at Dallas team used shape memory polymers to mimic the properties of the real thing. By the real thing, they mean the whiskers on our pets and wildlife. In the animal kingdom, whiskers on cats are used to probe and sense things in their environment. Seals are a great example. They have long whiskers with which they sense fish. Recent studies with blindfolded seals showed they could find fish swimming in a pool solely through their whiskers. 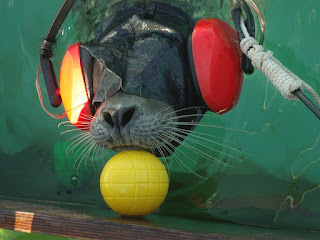 The whiskers sensed water disturbances which gave the seals information on where the fish were. Animal whiskers are touch receptors, sending vital information to the brain and helping animals navigate their environment. The robotic sensor is patterned on top of each whisker. Each whisker has about the same diameter as that of a human hair. This capability is an important breakthrough because it paves the way for robots and prosthetics to have animal-like feelings and feedback to maneuver in their environment. University of Texas researchers say the e-whiskers can detect force, temperature, proximity, stiffness, pressure and topography. They mimic the sensing capability of human skin. The application of this breakthrough to robotics is significant. It will allow robots to determine what's hot, cold, smooth, rough, hard and soft. That will allow robots to identify objects and interact with them safely, making the robots more "human friendly". The researchers are now focusing on replicating the human touch with prosthetics and improving upon it. They say the e-whiskers exceed the capabilities of human skin by an order of magnitude. They believe it's possible e-whisker prosthetics could have better sensitivity than the human hand.